Ever since I made that Indoor Grilled Traditional Pizza and those to-die-for BBQ Beef Boneless Short Ribs with Bacon BBQ sauce I’ve been wanting to make this type of pizza in the worst way. This pizza was so friggen good that I made it 4 days in a row for me. I wanted nothing but this pizza. I had it sometimes twice a day – lunch AND dinner! It’s just so sinful and … dirty. You know that kind of food where you feel so guilty eating it, like you’re doing something bad and you wanna confess but you can’t help yourself and you just continue eating it. and I loved every single bite of this flavor explosion! Dear sweet Jesus that beef short rib meat… If you haven’t made the short ribs yet, you are seriously missing out on the 8th wonder! Now if you’ll excuse me, I need to go make this again because just thinking of this pizza and how amazingly delicious it is I cannot sit still! In a bowl combine the BBQ Spiced Bacon seasonings. Dredge both sides of the bacon in the spice mixture and place on the cooling rack. Bake for 13 minutes, flip and bake for another 13 minutes. Remove from the oven and allow to cool 1 minute on the rack and then using cooking tongs, remove the bacon from the rack and plate. Remove the lid, flip and working fast top with your sauce, beef and cheeses. Uncover, place the bacon on top and cook for 1 minute or until the cheese is melted and the crust is crispy. Remove from the pan with large spatula and drizzle with additional BBQ Sauce. 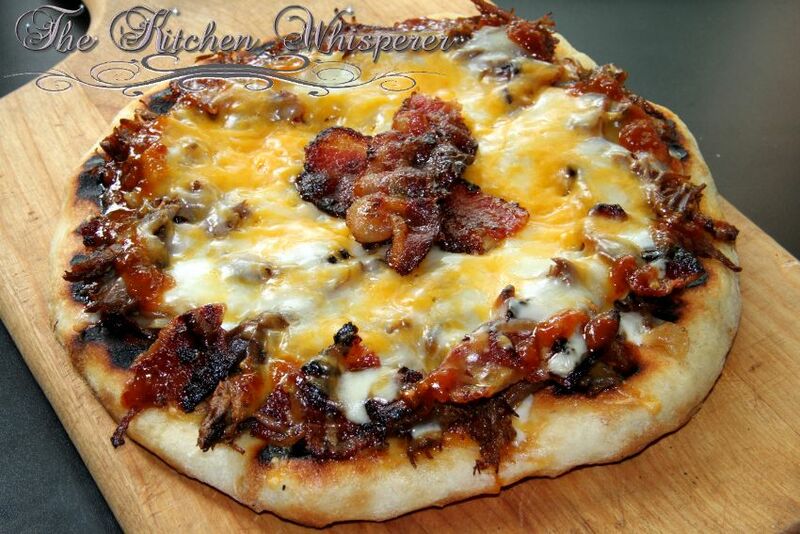 Do you toss the short ribs in the bbq sauce as well as putting the bbq sauce on the dough? Hi Doug! I do, yes. It really depends on how saucy you like it. I wouldn’t make it too saucy though as you want a crisp crust. You can always drizzle on warm sauce when it’s done.